Aquasana® Drinking Water Filter (AQ-4000) - Consumers Digest "Best Buy" 6 years running (2003-2008)! Dual-Filter Drinking Water System complete with 2 filter cartridges, faucet diverter and easy to follow instructions (Countertop model). The healthiest, best tasting water on Earth... 100% satisfaction guaranteed! This product is not intended for use on water of unsafe or unknown microbiological quality and should only be used on municipal treated water supplies or other potable water sources. Both cartridges are made with extruded coconut shell carbon, and the B-cartridge is impregnated with BASF® ATS ion-exchange sorbent resin. BASF® ATS powder is a patented high capacity ceramic (titanium silicate) cationic ion-exchanger with high specificity for lead removal from water, even in the presence of competing ions like Calcium, Magnesium as well as other metals. The A-cartridge is 5 micron absolute, and the B-cartridge is .5 microns absolute, meaning that particles 200 times smaller than a human hair cannot pass through the B-cartridge (human hair is 100 microns in thickness). 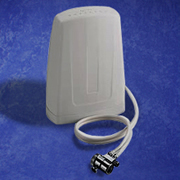 This allows for filtering out chlorine-resistant parasites, such as Giardia and Cryptosporidia. Aquasana is the #1 rated home water filter system in America, works better & costs less than any other brand - see ComparisonChart . This patented twin cartridge drinking water filter installs in seconds to standard kitchen faucets and provides up to 30 gallons an hour of ultra-filtered high quality water for drinking, cooking and other beverages. See Aquasana AQ-4000 PerformanceSheet for performance specs. You will need Adobe Reader to open .pdf files. Includes filter housing, chrome faucet diverter, and twin filter cartridge set (lasts 6 months / filters 500 gallons - whichever comes first). Aquasana AQ-4000 Drinking Water Filter is a non-pressurized filter and MUST NOT be installed in a constant hydrostatic pressure environment, such as a fridge filter, or a water cooler filter. Read instructions carefully before making any modifications. Outer Dimensions: 9" x 7.5" x 3"
You get the very best water, the best value and the most convenience, at a fraction of the cost of bottled water! Answer: Because it is very important that the A-cartridge not be bypassed by the untreated water, the AQ-4000 forces a strong seal on the A-cartridge. If you are having difficulties removing your A-cartridge, all you need to do is fold up a towel on your kitchen counter, and with the A-cap removed, give the filter a couple of turns (with your fingers), then a light tap or two on the counter, and the cartridge should jump right out. If this does not work for you, please call Sun Water Filter Systems tech support at 1 (877) FDA-PURE. Question: If I'm the only one using the filter, can I wait 12 months to change the cartridges? Answer: The AQ-4000 is certified to treat 500 gallons, which means that we had to prove the performance through 1000 gallons to give you a built in safety window. Even a family of 6 is unlikely to use a full 1000 gallons in a six month period. However, carbon is the building block of life, and will allow bacteria to colonize on its surface as soon as it gets wet. Unlike the AQ-4100 and EQ-300 which use KDF-55 (55% copper, 45% zinc), the AQ-4000 does not contain anything to inhibit bacteria growth. We use B.A.S.F. ATS Sorbent Medium ion exchanger in place of KDF-55 in drinking water filter because it has better 2+ ion affinity at low flow rates and low temperatures. Some companies use silver to prevent bacteria build-up, but recent studies have shown that silver has similar health effects to lead. Silver collects in the left testicle or the left ovary and can cause hypertension, brain damage, and other negative health effects. Companies that use silver in their cartridges must register their products with the FDA as a pesticide. Because there is nothing toxic in our cartridges to prevent bacteria growth, the AQ-4000 will reach detectable levels of heterotrophic bacteria after 7-8 months, and dangerous levels after 12-14 months. To prevent bacteria build-up, the AQ-4000's cartridges should be changed every 6 months, regardless of use. The KDF-55 used in the AQ-4100 and the EQ-300 prevents them from growing bacteria, so a single person using the AQ-4100 Pure Shower System can go a full year between cartridge replacements, and the Rhino EQ-300 can be used until your water bill shows that you've used over 300,000 gallons. It's a well know fact that water in your area has high sediment levels. This tends to clog the 5 micron ("A") filter cartridge prematurely, gradually lowering your filtered water output before the recommended six month period is reached. In order to alleviate this problem, Sun Water Systems has developed special sediment prefilters. Those are small (3"x3"x2") devices that can be installed on the Aquasana AQ-4000 inbound water line to filter out the sediment before it can affect the main filter. Once a sediment prefilter is installed, it should prolong the life span of your Aquasana Water Filter. If your filtered water output has been diminishing steadily, you can add a sediment prefilter to your order by selecting appropriate option below. Available for Countertop or Under-Sink setup. Prefilter assembly needs to be purchased only once. 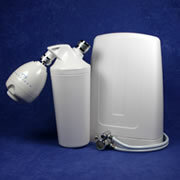 Then, every six months or so, you can purchase prefilter refills in quantities of 6, 12, 18 or 24. They are available as an option with the main filter replacement cartridges. You must, however, bear in mind that using sediment prefilters alone can't guarantee that all particulate matter will be eliminated. In extreme cases, a combination of sediment prefilters and more frequent 'A' cartridge changes may be needed. Please, keep us apprised of your particular needs. Two of our best selling filters, Aquasana® Drinking (Countertop) Water Filter AQ-4000 and Aquasana® Shower Filter AQ-4100 - for chlorine, chloramines or well water applications - (both Consumers Digest "Best Buy" repeated winners) at a discounted price - you save $9.32 over buying the two separately! 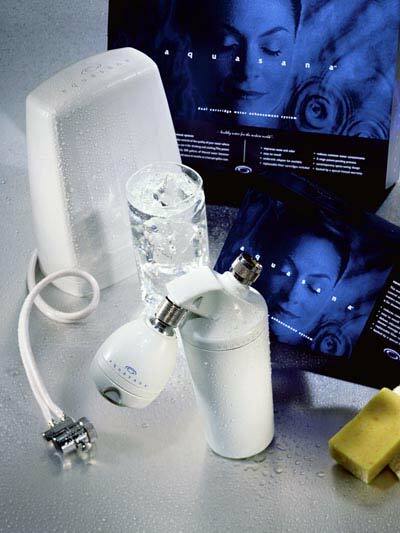 The Aquasana Water Filter products are the Best!